Skin Care, Bath & Body. Westinghouse Urban Gale 52-Inch Three-Blade Indoor Ceiling Fan, Brushed Nickel - 7202000. This Product Is On Sale For A Limited Time! Product Code: WL7202000 Stock Status: In Stock & Available. Shop Our Store With Confidence! 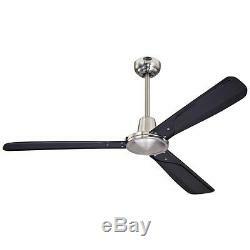 Product Features: This Westinghouse Urban Gale 52-inch indoor ceiling fan brings contemporary industrial-inspired style and superior performance to your home decor. The Urban Gale features a 171-by-12-millimeter cold-rolled steel motor with a dual capacitor for powerful, quiet air circulation. Three fan speeds (high/medium/low) and a reversible switch keep you cool in the summer and warm in the winter. Includes a 1/2-inch by 12-inch (D x L) down rod, 54-inch lead wire, three-speed handheld remote control and two AAA batteries. Please note: The Urban Gale ABS fan blades operate at higher speeds than traditional ceiling fans and they must be hung at least 10 feet above the floor. Brushed nickel finish and 3 black ABS blades. For high-ceilinged rooms up to 360 sq. Airflow: 5,174 CFM; Energy Usage: 60 W without lights; Airflow Efficiency: 86 CFM/W. (D x L) down rod, 54 in. Lead wire, 3-speed remote control and 2 AA batteries. Overall Dimensions: 52"(D) x 52"(W) x 18.9(H). Item Weight: 11.02 lbs. Please note that this product is designed for use in the United States only (110 volt wiring), and may not work properly outside of the United States. We are a Boston-based store dedicated to providing you the very best products at the lowest possible prices while delivering the absolute best in personalized customer service. Simply put, we are a small company that specializes in big service. Unlike the big box stores and super-centers, we aim to provide you a specialized shopping experience that caters to you as an individual. Our dedicated staff will answer your calls without having to deal with automated prompts and robot customer service. Our award winning service isn't the only reason you'll shop with us. Our goal is to provide you with a huge selection and the freedom to choose from only top quality products, without overwhelming you with poor value options. Sifting through thousands of products can be daunting, confusing and frustrating! We have hand-selected our catalog to meet a variety of design styles across a wide range of different prices to suit all of your home furnishing needs. Are you a designer or builder with a large project? Thank you for visiting ShopFreely and don't forget to "like" us on Facebook for even more designer tips, sale notifications, and valuable coupons. Our contact information can be found by clicking on our name, "Shop_Freely", at the top of the page and then clicking "Contact Member". It's just another reason why you always shop freely with ShopFreely! At ShopFreely, we stand by our products and our customers. The few exceptions include unsealed mattresses, assembled or modified products, and clearance merchandise which will note this within the product details. The Return Authorization Number allows the warehouse to identify your return when it arrives and helps us credit you as quickly as possible. Please note that the original packaging must always be used when returning product(s) back to us. At ShopFreely, we know how important it is to provide our customers with a safe and secure shopping experience. We want all our customers to be free from worry and have peace of mind while shopping at a trusted and reputable store. We treat the security of your personal information with the utmost care and use only the most state-of-the-art 128-bit hacker-safe SSL encryption to secure all data we collect at ShopFreely. How do you know when your data is secure? This indicates that you are protected within our 128-bit SSL secure server, where all data is encrypted for optimal security. Powered by Solid Commerce The All-in-One Listing, Inventory & Order Management Solution. The item "Westinghouse Urban Gale 52-Inch Three-Blade Indoor Ceiling Fan, Brushed Nickel" is in sale since Monday, February 1, 2016. This item is in the category "Home & Garden\Lamps, Lighting & Ceiling Fans\Ceiling Fans". The seller is "shop_freely" and is located in Multiple Locations. This item can be shipped to United States, Canada, United Kingdom, Mexico, Germany, Japan, Brazil, France, Australia, Denmark, Romania, Slovakia, Bulgaria, Czech republic, Finland, Hungary, Latvia, Lithuania, Malta, Estonia, Greece, Portugal, Cyprus, Slovenia, Sweden, South Korea, Taiwan, South africa, Thailand, Belgium, Hong Kong, Ireland, Netherlands, Poland, Spain, Italy, Austria, Israel, New Zealand, Philippines, Singapore, Switzerland, Norway, Saudi arabia, United arab emirates, Qatar, Kuwait, Bahrain, Croatia, Malaysia, Chile, Colombia, Costa rica, Dominican republic, Panama, Bahamas, Viet nam.